Presenting scamper technique ppt icon. Presenting scamper technique ppt icon. 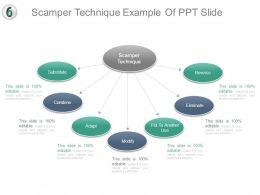 This is a scamper technique ppt icon. This is a seven stage process. The stages in this process are substitute, combine, adapt, modify, put to another use, eliminate, reverse, scamper technique. Presenting scamper technique powerpoint slide designs. This is a scamper technique powerpoint slide designs. This is a seven stage process. The stages in this process are adapt, modify, combine, substitute, put to another use, reverse, eliminate. Presenting scamper technique ppt background. This is a scamper technique ppt background. This is a seven stage process. The stages in this process are scamper technique, modify, combine, substitute, put to another use, reverse, eliminate, adapt. 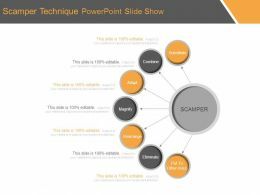 Presenting scamper technique powerpoint slide presentation guidelines. 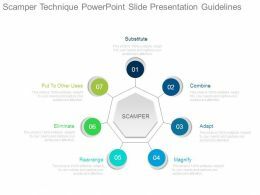 This is a scamper technique powerpoint slide presentation guidelines. This is a seven stage process. The stages in this process are adapt, magnify, rearrange, eliminate, put to other uses, substitute, scamper. 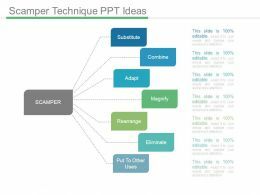 Presenting scamper technique ppt ideas. This is a scamper technique ppt ideas. This is a seven stage process. The stages in this process are substitute, combine, adapt, magnify, rearrange, eliminate, put to other uses, scamper. …scamper technique powerpoint slide show. Presenting scamper technique powerpoint slide show. This is a scamper technique powerpoint slide show. This is a seven stage process. The stages in this process are substitute, combine, adapt, magnify, rearrange, eliminate, put to other uses, scamper. 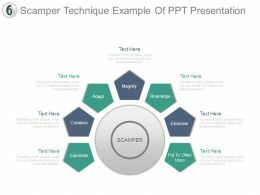 Presenting scamper technique example of ppt presentation. 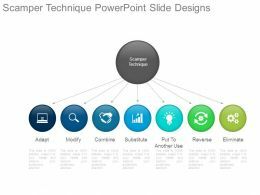 This is a scamper technique example of ppt presentation. This is a seven stage process. The stages in this process are substitute, combine, adapt, magnify, rearrange, eliminate, put to other uses. Presenting scamper technique example of ppt slide. 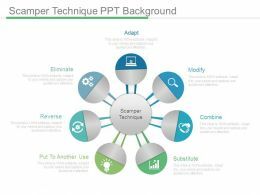 This is a scamper technique example of ppt slide. This is a seven stage process. The stages in this process are substitute, combine, adapt, magnify, rearrange, eliminate, put to other uses. 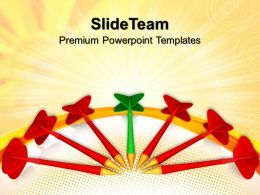 …PowerPoint Template Shows you the seven darts placed together to form a semi-circle. It signifies bound, career, cast, course, dash, flash, fling, flit, float, fly, gallop, hasten, heave, hurry, hurtle, launch, move quickly, pitch, plunge, run, rush, sail, scamper, scoot, scud, scurry, shoot etc.